After months of meetings and speculation about the Senate’s plan for judicial selection, a proposal was unveiled Wednesday during a nearly four-hour meeting in which lawmakers spent more time bickering with each other than they did discussing issues. Members of the Senate Select Committee on Judicial Reform and Redistricting ultimately voted to create a joint House and Senate committee to study the new proposal, in addition to judicial redistricting, giving credence to the likelihood there won’t be any action on judicial selection during next week’s special session. Committee Co-Chair Sen. Bill Rabon (R-Bladen, Brunswick, New Hanover, Pender) told members that there was still work to be done and that such a proposal, which would have to be an amendment to the Constitution and approved by voters, would be a hard sell. “It’s going to take both parties,” he said. 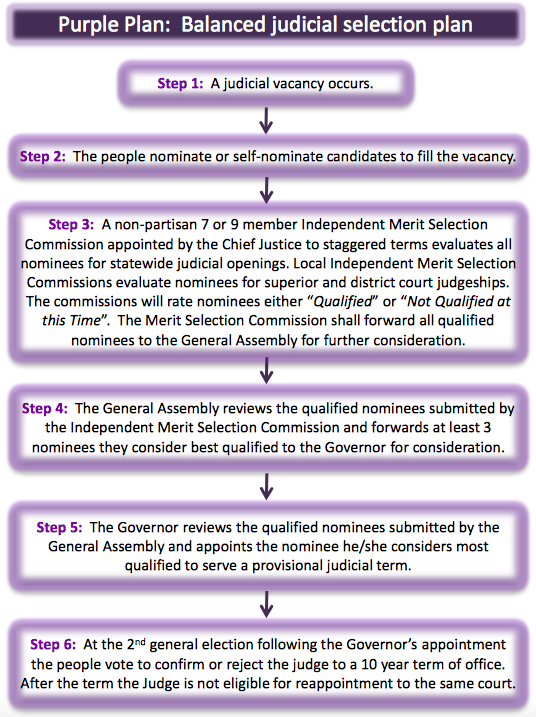 The proposal, dubbed the “Purple plan: balanced judicial selection plan,” gives the state Supreme Court chief justice considerable power over a nominating commission — something no other state does — and puts lawmakers at the helm of choosing future judges in the state. “The purple plan presents a twist I haven’t seen before, but that shouldn’t distract from the fact that the legislature is still proposing to give itself nearly all of the power when it comes to judicial appointments,” said Douglas Keith, a judicial selection expert at the Brennan Center for Justice. The plan would grandfather in current judges. Once a judicial vacancy occurs, the chief justice would appoint a seven to nine member merit selection commission to staggered terms to evaluate nominees. The commission would rate nominees as “qualified” or “not qualified at this time” and then submit the qualified names to the General Assembly. The General Assembly would then choose at least three nominees to send to the Governor, who would appoint one person to the open judgeship. After the second general election following the Governor’s appointment, the judge would face a retention election to a 10-year term. After serving that term, the judge would no longer be eligible for reappointment to the same court. The term is one that sparked some discussion among lawmakers and is one of the issues to be studied by the joint commission. The “twist” Douglas referred to is the chief justice’s role in the proposed judicial selection process. Mark Martin, a registered Republican, currently serves as North Carolina’s chief justice. Douglas said he wouldn’t see the chief justice’s role in the purple plan as a potential conflict of interest, and said sitting judges have a valuable perspective when it comes to judicial applicants. In describing the purple plan at the committee meeting, Sen. Paul Newton (R-Cabarrus, Union) said it is a balance between independence and accountability while also considerate of judges’ request for stability. There was some debate about the plan, but it is expected to continue once a joint subcommittee is appointed.